The California Gold Rush of 1849 and San Francisco's Earthquake of 1906 spurred expansion, rebuilding and extensive timber processing in California. 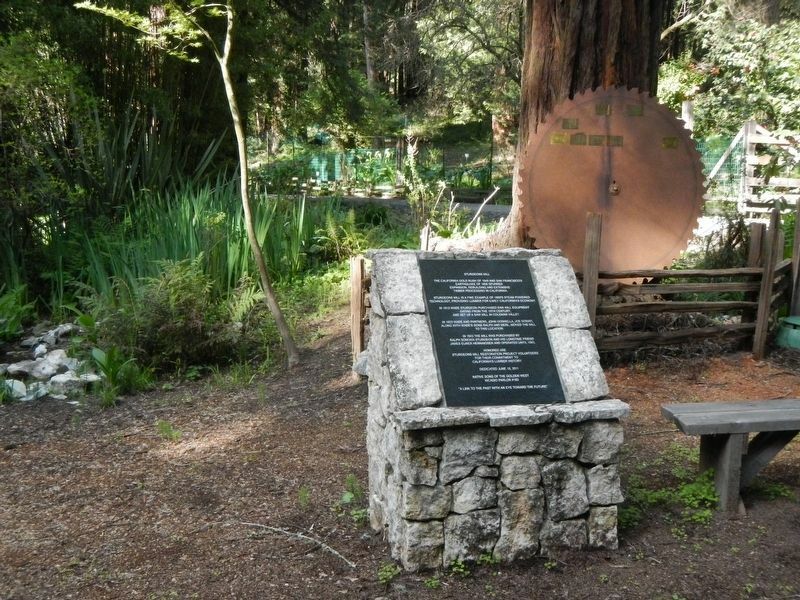 Sturgeons Mill is a fine example of 1800's steam powered technology, providing lumber for early California's economy. In 1913 Wade Sturgeon purchased saw mill equipment dating from the 19th century, and set up a saw mill in Coleman Valley. In 1923 Wade and partners, John Gonnella, Joe Donati, along with Wade's sons Ralph and Merl, moved the mill to this location. In 1943 the mill was purchased by Ralph Sonoma Sturgeon and his long time friend James Eijner Henningsen and operated until 1963. 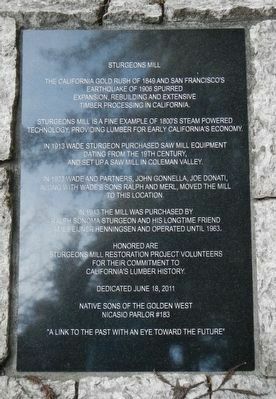 Honored are Sturgeons Mill restoration project volunteers for their commitment to California's lumber history. "A link to the past with an eye toward the future"
Erected 2011 by Native Sons of the Golden West, Nicasio Parlor No. 183. 38° 24.765′ N, 122° 53.778′ W. Marker is near Sebastopol, California, in Sonoma County. Marker can be reached from Green Hill Road near Occidental Road, on the left when traveling west. Touch for map. Marker is at or near this postal address: 2150 Green Hill Road, Sebastopol CA 95472, United States of America. Touch for directions. Other nearby markers. At least 8 other markers are within 7 miles of this marker, measured as the crow flies. A different marker also named Sturgeon's Mill (here, next to this marker); Freestone House (approx. 3 miles away); Hogan Building (approx. 4.1 miles away); Running Fence (approx. 4.6 miles away); Watson School (approx. 4.6 miles away); First Power Commercial Sawmill (approx. 5.6 miles away); The Wohler Ranch -- 1856 (approx. 5.9 miles away); Potter School Est. 1873 (approx. 6.2 miles away). Touch for a list and map of all markers in Sebastopol. More. Search the internet for Sturgeons Mill. Credits. This page was last revised on April 6, 2017. This page originally submitted on April 6, 2017, by Barry Swackhamer of San Jose, California. This page has been viewed 207 times since then and 6 times this year. Photos: 1, 2. submitted on April 6, 2017, by Barry Swackhamer of San Jose, California.